BITSAT 2019 Application Form: Birla Institute of Technology and Science Aptitude Test (BITSAT) is an entrance exam conducted through online mode only. Through this exam, candidates can get admission into the BITS campuses located in Pilani (Rajasthan), Goa, Hyderabad & Dubai for the Integrated First Year degree programme in engineering & pharmacy. BITSAT 2019 exam is managed by the head controller of examination. This exam will be held at university-level. Candidates seeking admission into BITS Pilani and other BITS campuses for engineering and other courses can register for the BITSAT Registration Form that will be available from the 3 week of December month. Here we have mentioned the detailed information about how to register, last date of registration, eligibility to apply etc. Check here tentative exam dates of BITSAT 2019. 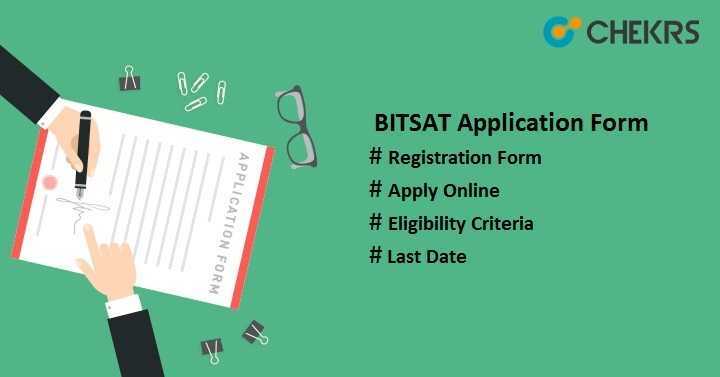 Candidates must check here the BITSAT Admission Criteria before applying for the BITSAT 2019. Candidates should have passed class 12th or equivalent examination from any recognized board to get admission in either BTech or BPharm. Candidates having PCM (Physics, Chemistry & Mathematics) stream will be considered for BTech course and for BPharm. programme, candidates should have PCB (Physics, Chemistry & Biology) stream in 12th. Aspirants must have obtained at least 75% aggregate in marks in PCM/ PCB subjects and a minimum of 60% marks will be required in each of Physics, Chemistry, Mathematics/ Biology subjects. Candidates appearing in the Class 12 examination in the year 2019 can also apply for this examination. For direct admission, students have to obtained highest aggregate marks in class 12th in PCM/ PCB subjects among all the candidates who have taken 12th exam in year 2019 from the central board. Other Details Recent, Colored, Light Background Colored, On white paper with black/ blue pen. Click on “Click Here” to apply online, link available on the home page. Read the instructions and click on tab “Allow me to Apply Online”. Then, click on “New Registration” button and proceed to the registration form page. Fill the entire mandatory empty field with correct data and then click on “Proceed” button. After completing the registration, fill the application form. Enter all necessary details like personal details, address, qualification details, select test centers, choose subjects etc. Then, click on “Submit” button. A pop-up will be generated that after submission you can’t modify the details. After submitting the application form, the next process is to upload all scanned images. Click on “Browse” button and then “Upload” button to upload recent, colored photograph & signature. Images must be uploaded as per given instructions and in the specified format. Click on “Submit” button to upload the images. Next process is to pay the application fee. Fee can be paid through online mode or also can be submitted through generated pay slip i.e. e-challan of ICICI Bank. Choose the option available there as per your choice. If you want to pay through payment gateway, click on button “Click Here”. Select option among net banking/ credit card or debit card. Enter the card details and then click on “Yes, I agree and pay now”. Candidates can also generate slip of ICICI Bank and pay at the nearest ICICI Bank. Last step is to take the print-out of filled application form. Candidates are required to know the application fee and pay as per their category. After filling the Application form You will search for the preparation Stuff, So we have good news for you, that we already have a separate article for all the preparation stuff you can access that article using the link: BITSAT Syllabus 2019.